The gig/freelance economy is built on trust and has grown dramatically in recent years, with more and more people using it as an opportunity to exchange their skills or belongings for money. The availability of an on-demand, peer-to-peer workforce has enabled platforms like Airbnb, Uber and eBay to scale exponentially. It is important to understand the key factors that helped build trust in these online marketplaces. What can businesses which rely on peer to peer trading do to ensure they are considered honest and trustworthy? What makes for a ‘good gig’ platform? The answers are not always easy. At Limitless we know that all too well but take pride in having built an ethical gig company that focuses on fair practices and transparency for all users. Limitless is a crowdsourcing platform that allows brands to connect with their most loyal customers and reward them per task for providing customer service. Thanks to years of experience in the customer service industry, we knew a thing or two that helped us create the perfect Crowd ServiceTM platform. What seems like a simple concept (customers helping other customers) has taken time and years of painstaking research to develop and forge into a platform that people trust and enjoy using. Here’s what we’ve learnt along the way. We know that customers want to be able to trust the person they’re speaking with and the best way to achieve this is to create a robust rating system. Actionable rating systems have worked well for platforms like Uber & Airbnb where both customers and drivers/hosts anonymously rate their experiences. However, a criticism levelled at some marketplace platforms is that their algorithms are not always fair. For example, if a passenger behaves badly and a driver ends the journey early, the passenger may provide the driver with a low rating and make a complaint. It is important in these situations that there are countermeasures to ensure that incorrect or unfair ratings can be re-adjusted so they do not negatively affect users. At Limitless, we use a two-tiered rating system. Firstly, fellow Limitless Ambassadors (platform users providing the service) rate their peers’ responses, ensuring all answers are accurate and helpful. Customers (who receive the answers) also rate the answers. This joint feedback determines an Ambassador’s reputation score, which in turn affects their in-app status. The better an Ambassador’s reputation score, the more privileges they have on the platform. Our rating algorithm is cleverly designed to create a self-regulating community where peer-to-peer reviews determine the user’s status, privileges and earning potential within the community. For those rare occasions where Ambassadors receive a low rating from a customer and their peers, the platform is able to flag these cases to our Community team for investigation. Most of the online marketplaces we know and love are enabled by technology but ultimately powered by people. Customers’ preferences are constantly changing, as people expect fast and reliable answers. When we created Limitless we were conscious about striking the right balance between automation and human effort. Our SmartCrowd platform uses machine learning to learn from real-time conversations and provide automated responses to high volume, simpler queries. This is achieved by Ambassadors training the AI by selecting or rejecting system prompted answers. The AI constantly learns from every interaction on the platform between Ambassadors and customers. This allows Ambassadors to deal with more complex queries or where the customers want feedback or advice from an experienced user. And where does that knowledge sit? With your experienced product users– your employees, partners and customers. An intuitive online marketplace should harness the powerful and native knowledge of its users to provide great customer experiences. With Limitless, Ambassadors are equipped with all the knowledge tools they need to provide a great customer experience. It doesn’t stop here though; there are vital ‘push’ and ‘pull’ channels through which knowledge is disseminated on the app. Furthermore, automated ‘suggested answers’ help drive organic learning. Social proof plays a huge role in demonstrating how trustworthy a brand or a marketplace member is. Airbnb does this very well by utilising Facebook data to show how many friends a guest may have in common with the host to help put guests’ minds at ease. 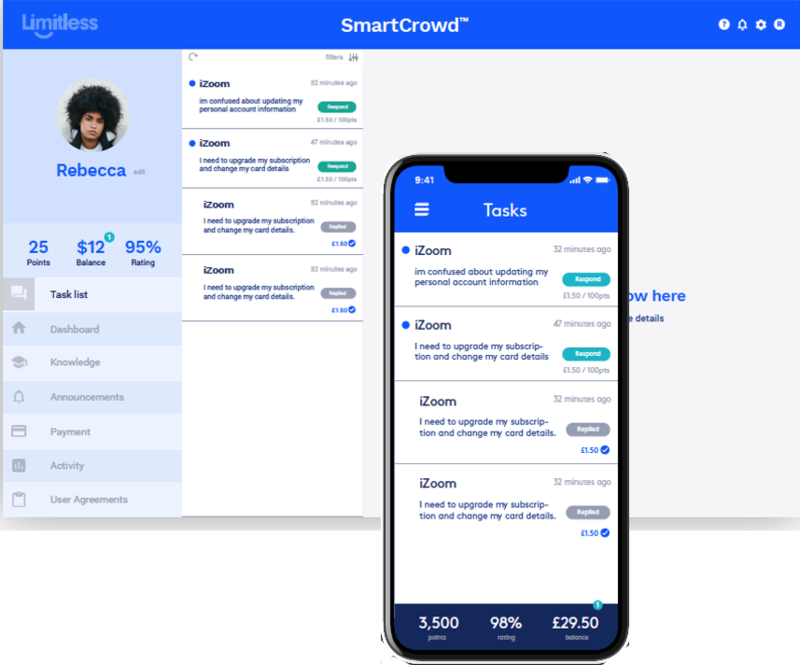 The Limitless SmartCrowd platform has a number of features designed to leverage social proof. If a customer is waiting for a response from an Ambassador, they will be told what the average wait time is to help manage expectations. When a customer has received a response, we’re able to provide information on the Ambassadors’ past performance to demonstrate their knowledge and increase customer confidence in the platform. These are key components that enhance the customer’s trust in the overall experience. To summarise, for a business to boom in the gig/freelance economy, it must be built on transparency and trust, or customers will quickly lose faith. The gig/freelance model offers many benefits to businesses and the wider economy. To really take advantage, it’s critical to build an ethical gig company (and really mean it).